Today, we're talking about jewelry. And if you've been watching the fashion/beauty headlines, then you know that necklaces are in---bold pieces, cascading gems, big stones, etc. Why wear any jewelry? Simply, because it's pretty. It can make an outfit. And jewelry illuminates your face. A nice pair of pearls can make your skin glow. 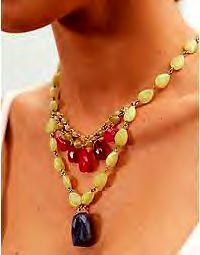 But if your jewelry doesn't shine like it used to, try these easy, on a budget recipes to bring back their brilliance. Most households already have these products in their cupboards. And the Jeweler's Association recommends these steps. Professional jewelers use sonic cleaners to remove dirt and grease from fine jewelry. Sonic cleaners feature vibrations, in combination with water and a jewelry cleanser to nicely battle grime. But not all types of gems and baubles are appropriate for this machine. Remember this: Jewelry and Chlorine Bleach Spell Disaster!! Diamonds, especially, do not fare well when coming into contact with bleach. Remove diamond rings and pendants, pearls and platinum, gold and emeralds, and silver, too, before getting into a chlorinated pool or hot tub. Even hand washing clothes with a little bleach can ruin your diamond ring. The chlorine-based products may damage and discolor the mounting. And bleach also can eat away at gold and platinum, as well as erode the finish and polish on many gems. Pearls are delicate and precious, and the more you wear them, the better it is for their luster because your natural skin oils are absorbed each time you put them on. Within 24 hours of wearing pearls, take a soft cloth and moisten in a mild soap and water solution and clean each pearl, one by one. Wipe off with a damp, cloth and allow the pearls to air-dry overnight. Gold and platinum are strong and lovely, but can dent while doing housework. And soap can make such metals look dull, so best to remove while showering. A nice way to restore the brilliance of gold or platinum is a quick dunk into some rubbing alcohol. Rinse off and then dry. If you have a little more time, mix a solution of dish-washing liquid in a small bowl of warm water. Soak gold/platinum for about 15 minutes, then gently clean with a soft-bristled brush. Rinse with lukewarm water. Then dry and buff your gold or platinum with a soft cloth. Sterling silver is the kind of jewelry that benefits by frequent wearing because it helps prevent tarnishing. If your pieces are tarnished slightly, rinse them in very hot water and pat them dry. Otherwise, a mild soap and warm water solution soaking works nicely to restore shine. Wrap or store your sterling silver items individually in a closed box or tarnish preventive bag. Silver does not do well in dampness or air. For colored beauties like rubies, sapphires, amethysts, and quartz, make a solution of a few drops of mild dish-washing liquid into a warm bowl of water. Soak each piece and clean with a soft-bristled brush. Rinse off and pat dry with a soft cloth. Treat your emeralds the same way. But have emeralds oiled by a jeweler every few years in order to maintain their special luster. And keep colored stones away from saltwater, too, which over time, slowly erodes the finish and polish. Stored colored gems separately to prevent the chipping of softer items nearby, like gold and pearls.